Our team is dividing and conquering this week. We're off to sunny Orange County and Chico this week. Then, both teams are taking a little time to relax! We'll be back next week with new posts! 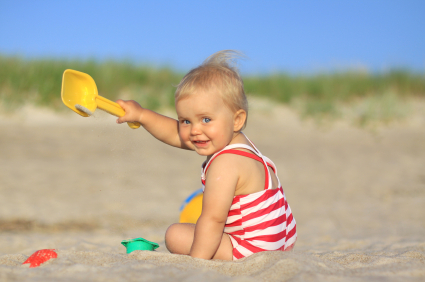 Last summer we shared a post about keeping your baby safe during the summer. The post included tips to keep your baby cool, including adequate hydration and creating a safe (and cool) sleep environment. We also included tips for sun safety, including use of sun block and American Academy of Pediatrics recommendations for sun exposure. Since summertime is here again, we wanted to repost this article for all of our new readers and those that would like a quick review about summer safety. Have a wonderful summer! Read our Summer Safety post here. We would like to wish all the dads out there a Happy Fathers Day! Given that so many families are traveling this summer, we thought we would update our earlier posts on traveling with babies. Last time, we shared some general tips. This time, we will share information specifically about flying with your baby. Many airports offer information online including the location of family restrooms. Be sure to find out where those restrooms are located in all of the airports on your route. Also, see if they have special (low pressure) lines for families at the security check points. For those of you traveling in the US, the Transportation Security Administration (TSA) has a very useful website that provides tips for getting through security with kids efficiently. Check with your airline for policies and rules related to family boarding, carry-on bags, car seats, and strollers. You don’t want to be stuck trying to consolidate your luggage or repackage liquids on the floor at the gate. TSA will test any bottles of breast milk or prepared formula so keep them handy. You may be a pro with collapsing your stroller and putting your baby in a carrier or sling when you have two hands but in a crowded airport with boarding passes in your hand, you might not have both hands free. Take the time to practice manipulating all of your traveling gear with one hand and/or with limited elbow room. Several moms told us that using a sling to carry your baby makes things much easier. For families traveling with toddlers, you want to take steps to make sure that your child does not move very far away from you. While it is not likely that your child will go far, there are just too many opportunities for children to get hurt in airports. 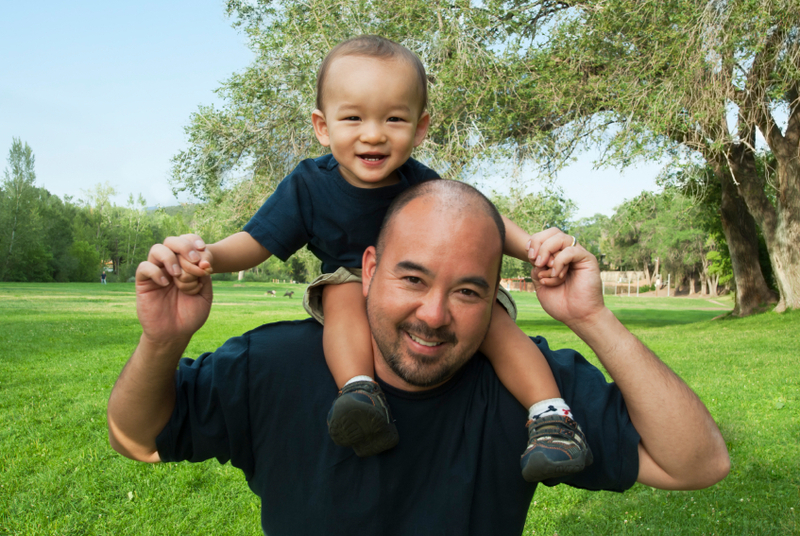 Keep your eyes open for hazards and your child in your arms or at your side. If you have a baby who loves to move, work on some "in the arms" repetitive games you can play to distract your baby when you must hold her. 5. Fly during off-peak hours. I realize that we are all at the mercy of the airlines when it comes to departure times, but if you have the option, try to schedule flights to coincide with your baby’s happiest times of the day. Try to fly at off-peak times (usually late morning to mid-afternoon in the middle of the week). Smaller crowds and less pressure to hurry can help reduce your stress. While airports and airplanes are not known to be baby-friendly places, there will always be a few experienced parents or grandparents around who know what you are going through and who will be happy to lend a hand (or even 2!). One of our readers told us to tell you that you shouldn’t be afraid to ask anyone for help! 7. Be prepared for your child’s discomfort. Flying can be particularly tough on babies and toddlers because they can’t move around very much during the flight and they feel unfamiliar and uncomfortable pressure in their ears during the landing. Try to get an aisle seat for easy access to the restroom and to the aisle for pacing. Swallowing can help reduce the pressure in babies’ ears so nursing or feeding babies as the plane descends can help. Reassure and comfort your baby during the rough patches. If you are doing everything you can to help your baby, don’t worry what others say or do around you. JenB and I were traveling again this week and found we were surrounded by families with children of all ages in the airports. Seeing them reminded us that this is a busy time of year for travel and we decided we should provide an update on an old post about traveling with babies. We'll start with some general advice and next time, we'll share some specific updates about traveling by plane. 1. Be prepared!- Traveling with kids can be hectic and challenging so you want to take extra time in planning your trip and imagining the "what ifs" a little more carefully than you would if you were by yourself. If you are driving, make sure you have good directions and check on traffic and driving conditions before you leave. Map out places to stop along the way (you WILL need to stop). With all the new technology that's available, planning for road trips has never been easier. If you are flying, remember that airports are busy this time of year. Plan on arriving at the airport about 2 hours early and try to avoid scheduling layovers that are shorter than 1 hour. Getting around with kids is tough enough without having to do it under pressure. 2. Comfort is Key - The trip will be much easier if your baby is comfortable, so make sure your baby is dressed appropriately. Consider where the sun will come into the car (if driving) and remember that airports can be fairly chilly compared to the temperature outside. Layers of clothing can be useful, just in case. 3. Nap time is a Nice Time - If possible, schedule driving time when your baby will be sleepy. 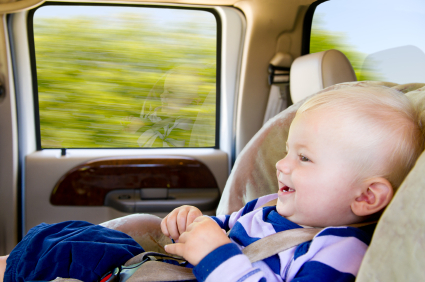 If you are going to be in the car during your baby's nap time, make sure that you provide a lot of fun physical activity or stimulation before you leave so that your baby is worn out by the time you get on the road. If you don't mind driving at night, you can wait until it is bed time to leave (just make sure that you aren't too tired!). Nap time is not the best time for flying since there is so much stimulation around airports. 4. Babies Get Bored Too - Traveling can be boring, especially for older infants and toddlers who have a lot of energy. Bring toys that vary in size, shape, and texture for your baby. Bring music, books, and crayons to keep toddlers entertained (magnetic drawing boards are fun and not messy). Remember, your face and voice are very entertaining to your baby so if you can, take turns driving so that someone can play with the baby when she tires of toys. 5. More is better - When packing for a trip, it is better to have a few extra outfits and diapers than to be stuck in a car or airplane with a stinky baby. Don't forget plastic bags, baby washcloths, and extra wipes! 6. One Less Thing to Pack - Most hotels have cribs that can be brought to the room so that you don't have to bring your own. When you make your reservation, ask about reserving a crib. If you aren't able to reserve it at that time, call right before check-in to reserve one. Many hotels will have it ready and waiting for you when you arrive. 7. Pay Close Attention to Cues - Remember too much excitement and fun can overwhelm your baby. Watch for your baby's cues (especially her "need a break" cues) to keep her from getting fussy. It is also helpful to plan some downtime several times per day when you and your baby can relax together. 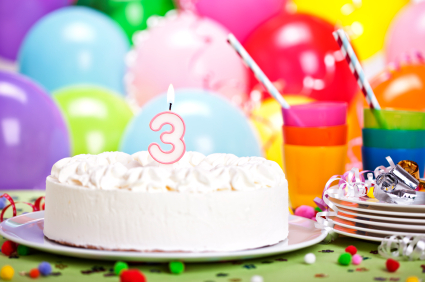 It is hard to believe that 3 years have gone by since we started our "Secrets of Baby Behavior" blog! Thanks to all of our readers who helped us grow from 40 pageviews in the first week to a total of nearly 650,000! We look forward to hearing from you over the coming year as we continue to learn and grow. Nearly every parent goes through it. You walk into a room filled with loving friends and family and your 9-month-old starts shrieking with fear, and clinging to your neck as if being put down would bring certain disaster. At first, your relatives come closer, trying to distract your baby with smiling faces and noisy toys. Your baby only frantically pulls away. Embarrassed and frustrated, you take your baby to another room and spend the party waiting for your baby to get tired enough for a nap. While some babies are just more fearful than others, there is a lot you can do to help your baby deal with his fears or you can make things a lot worse. In this post, we'll focus on babies' fears. In past posts, we've shared information about babies "temperament," the specific set of traits that give babies their unique personalities. We've also talked about how babies' temperaments can influence their relationships. Babies who are timid or who have intense reactions to new things are more likely than babies who are not to become fearful in new (or crowded) situations, especially when they are older than 6 months. Parents with those babies are not going to be able to keep them from reacting when they go into large groups or loud and busy places. But, parents can make things much worse if they don't understand how babies learn about their world and their emotions. Instinctively, babies will look their caregivers' faces when they are unsure how they should feel. When they see something new, they will glance at mom or dad to see what they think of the new object. Smiling, relaxed faces send a signal that the object is safe to explore. When babies meet a new person, they will look at their caregiver's face to figure out if this new person is safe and friendly or someone to avoid. This is called "social referencing." Parents who understand social referencing can help their babies deal more positively with new situations. For example, any parent in the situation described above is likely to be upset (embarrassment, frustration, and even a little anger may be on the parent's face). Their timid baby sees the large loud group and pulls back. Someone comes closer and the baby starts to cry, looking quickly at the parent's face. Seeing mom's negative expression makes the baby certain that this is a scary situation and things get much worse. Alternatively, parents who understand what is happening can keep their faces and body language positive, relaxed, and reassuring as their baby looks around. They can let friends and family know that the baby needs a minute to get used to things before they come too close. While staying positive won't take all the fear away, it won't last as long. Don't forget that "repetition to soothe" can be helpful in calming babies at any age but you want to make sure that you don't look or sound upset while you soothe your baby. And if you can, try not to keep the baby away from all the fun for too long. While your fearful baby will need lots of your attention and reassurance, your baby will learn in the long run that friends and family are not so scary after all.